Situated in the sophisticated Eixample Dreta district, this bright and homely apartment is located less than a 5 minute walk from Antoni Gaudí’s iconic Sagrada Família. Eixample is home to some of the finest restaurants, bars and cafés in the city, while still remaining in close proximity to the city centre. The comfortable apartment has 1 bedroom with a double bed, as well as a sofa bed in the living room, sleeping a maximum of 4 people. The fully equipped kitchen has everything required to prepare and enjoy home-cooked meals. Kitchen amenities include a cooker, toaster, oven, microwave, kettle and blender, as well as a dishwasher for your convenience. Relax in the cosy living and dining area, which features a comfortable corner-sofa, a flat-screen television and a dining table complete with 4 chairs. Both the living area and bedroom feature a set of large French doors each, which open out onto a balcony, allowing plenty of natural light to fill the rooms. 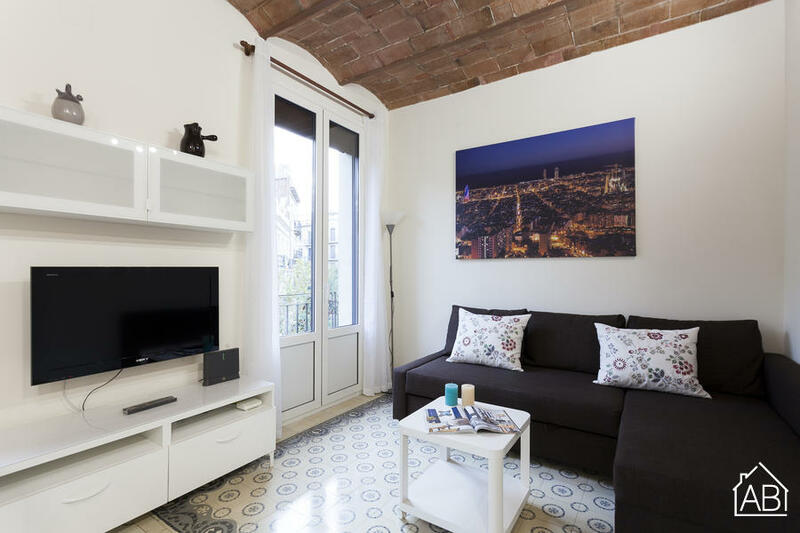 Further amenities offered by the apartment include air conditioning and wi-fi, as well as a washing machine, iron and hairdryer, making it the perfect choice for a longer term stay in Barcelona.